Pool Party At Our Place! Finally, a Libyan militia that knows what it's doing! 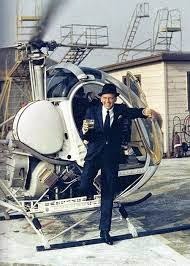 That looks like the most fun you can have without beer. Or female guests. 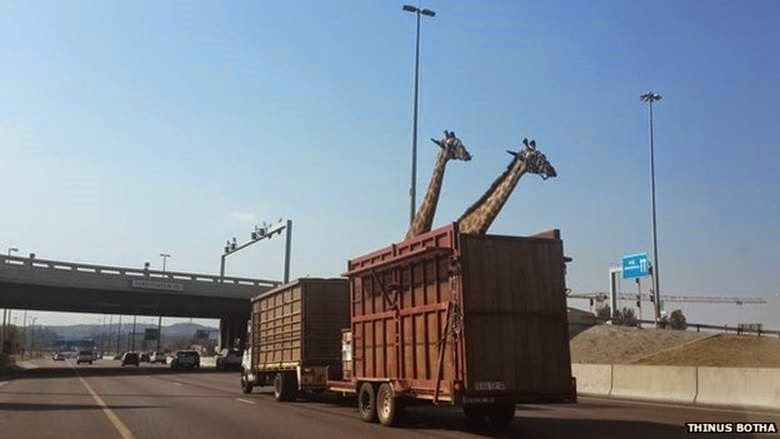 Eyewitnesses say the giraffe, one of two on a truck, hit its head on a bridge on Johannesburg's N1 motorway. There really is such a thing as television journalism from Gaza, after all. You just have to go to India to find it. See today's NYT story for the details, but the gist of it is that an Indian TV news crew noticed people erecting a tent on the property of the hotel where they were staying, burying something there and covering it with brush, then taking the tent down and skulking away. A day later, the rocket was remotely launched. The crew filmed this activity from the window of their hotel room. Their report was broadcast hours after the crew left Gaza. None of the hundreds of other journalists in Gaza have done anything similar, although I've got to believe most of them had the opportunity to observe and record HAMAS activity. So score one for honesty in journalism. But just one. 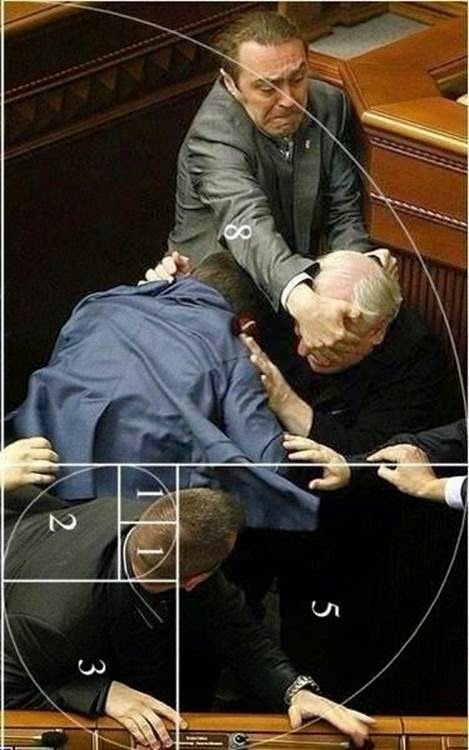 A big Tip'O the Hat to thei100 for noticing the classical Renaissance art proportions of this photo, taken from a typical day on the floor of the Ukrainian parliament. I love the Ukrainian Rada! The most pugilistic deliberative assembly in the world, I'm sure. See this compilation of the Rada's greatest hits, and prepare to be entertained. The video's actual title is "OBO Year In Review." However, it includes the next two, three, or even four years of new embassy construction projects in preview, as well. 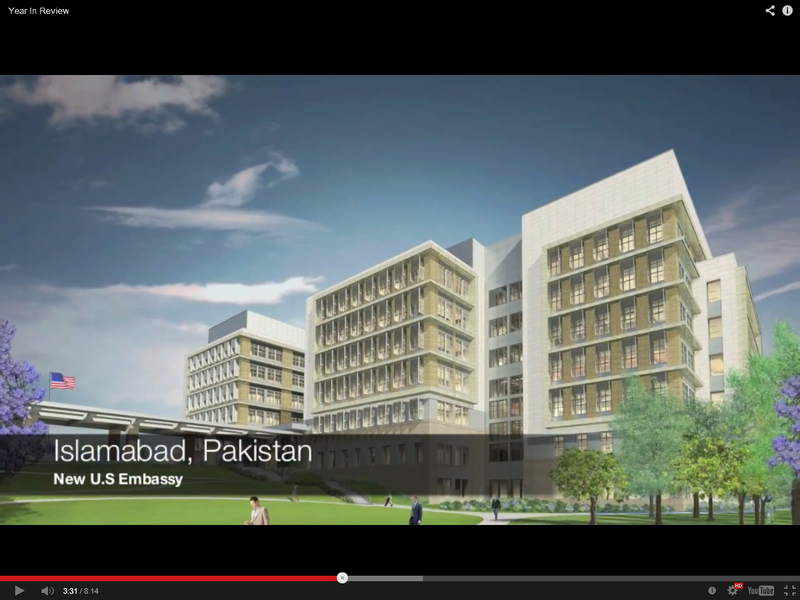 Here's one of those previews, a pastel watercolor artist's rendering of what the new chancery office building in Islamabad should look like when it's done, which ought to be a few years from now. Who could disagree with such Art, such architectural excellence? Maybe Representative Jason Chaffetz does, but not me. 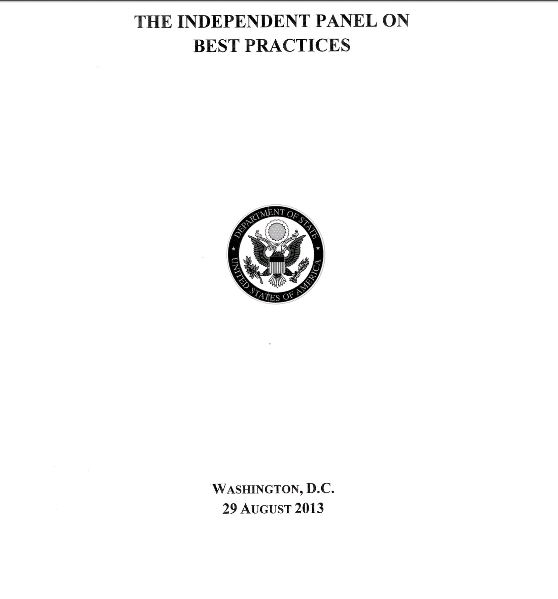 This afternoon the State Department released to the public the report of the Best Practices Panel, and also a fact sheet reporting on the progress it has made so far in implementing the Panel's recommendations. See the press release here. This is not the 'Grant Green report' on Diplomatic Security Organization and Management - you know, the one somebody leaked to Al Jazeera in May but which has still not been released to the public - but rather a separate review, one conducted by outside experts and with a somewhat broader focus on risk management. Today, the State Department made public the report of the Best Practices Panel (BPP), as well as a fact sheet detailing the State Department’s successful efforts to implement 38 recommendations from the panel to better evaluate and improve organization and management of U.S. security platforms. These actions represent another key step in implementing the independent Benghazi Accountability Review Board’s (ARB) guidance. Secretary Kerry has focused the Department on implementing the ARB’s recommendations to ensure that we are keeping our personnel safe while serving in a world of increasingly complex security challenges. The independent ARB on December 19, 2012, issued 29 recommendations. Recommendation four called on the Department to establish a panel of independent military, security and humanitarian experts to identify best practices from other agencies and countries to evaluate U.S. security platforms at high risk, high threat posts. The Department subsequently convened the BPP, composed of five security professionals from several agencies and an international organization. The BPP delivered its final report to the Department on August 29, 2013. The Panel’s work complemented the review by the independent ARB, adding critical context from the practices of other countries and agencies, as well as the private sector. The BPP made 40 recommendations, and the Department accepted 38. Many recommendations built upon those made by the Benghazi ARB including: establishing a Department-wide risk management model and policy; increasing hard-skills training for the foreign affairs community; and developing a security accountability framework. The Panel emphasized the importance of clear communication strategies on security matters. The Department appreciates the work of the BPP and will continue the process of implementing its recommendations. The security of Department personnel worldwide remains an ongoing priority for the Secretary and Department leadership. Click here to view the BPP report. Click here to view the BPP implementation fact sheet. The bottom line on implementation is that State rejected two of the Panel's recommendations, accepted and closed 30, and accepted but has not yet closed eight. Those not accepted were: (1) that the Department should establish an Under Secretary for Diplomatic Security, and (2) that the Department should provide waivers to security standards only "subsequent to the implementation of mitigating measures as agreed by regional bureau or other program managers, advised by DS, and as informed by the Department risk management model."